California's back roads & byways. There is nothing like the diversity of terrain in the Golden State, anywhere else in the world. National Forests feature many scenic routes. The roads listed below leads through some of the most breathtaking sites in the West, plus provide access to many recreation areas. Many activities can be enjoyed along these routes. Plan to stop & enjoy many views, picnic or take a small hike. Take Interstate 210 to La Cananda, exit Hwy.2 North into the Angeles National Forest. Drive approx. 50 miles to Wrightwood. Jackson Lake is also nearby. Horse rentals might be available in the area; check woth the locals. Plenty of picnic grounds & hiking trails around. Stop in town for lunch & relax in this forested retreat. Lodging is available in town. Loop back to I-15, by taking a right on Hwy.138 & continue down through the Cajon Canyon. 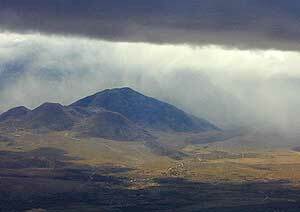 Winds between coastal mountain ranges & the Central Valley, past landscapes of pine forests and semi-desert vegetation. Stop here for lunch & relax in the quaint downtown area. Lodging is closeby. Backtrack 1 mi. & continue North on Hwy.33 as it winds through Wheeler Gorge & the beautiful landscapes of Los Padres National Forest . Be on the lookout for waterfalls which can be seen off the roadsides even in the driest years. Option to loop back to I-5, by taking a right on Lockwood Valley Rd. & continuing eastbound. See desert palm and oak, pine and fir forests. 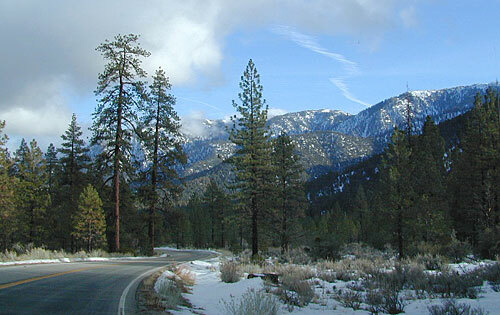 The San Jacinto Valley and San Jacinto Mountain peaks are viewed from this byway. Plus the fun lil Idyllwild mountain town. Following the crest of the San Bernardino Mountains, view spectacular sites, thick forests and autumn colors. Big Bear & Fawnskin. Drive up to Lake Arrowhead. Great place for lunch or even an overnight visit. Plenty of picnic grounds & hiking trails around. Take Hwy.18 over to Big Bear for fun on the lake. Horse rentals area available in the area. Return by taking Hwy.330 down the mountain. Laguna Mountain. meadows and forest with spectacular views of the Anza-Borrego Desert 5,000 feet below on the East. Pinyon-Juniper woodlands to the world's oldest living trees, the Bristlecone Pine Forest. Travels along alpine forests and meadows, with spectacular views of lakes and mountain peaks, and features volcanic landscapes. Showcases giant sequoia and Kings Canyon, one of the deepest canyons in North America. Climbs through dramatic and rugged Lee Vining Canyon, connecting the Basin landscapes with the high alpine meadow and the Sierra Nevada. Closed in winter. Side road - at the base of Whitney Portal Rd. Runs through the Sierra Nevada landscape of granite walls and domes. Spectacular views of majestic peaks in wilderness areas. Steep canyon walls and high mountain valleys, along grasslands, oak woodlands, mixed conifer and high desert chaparral. The northernmost portion of the Sierra Nevada range, the western terminus of the Modoc Plateau/Great Basin and the Lassen National Forest. Highlighted by the Smith River, this diverse geological land form hosts redwoods, rhododendrons and other magnificent ecosystems. Follow along the wild and scenic Klamath River. 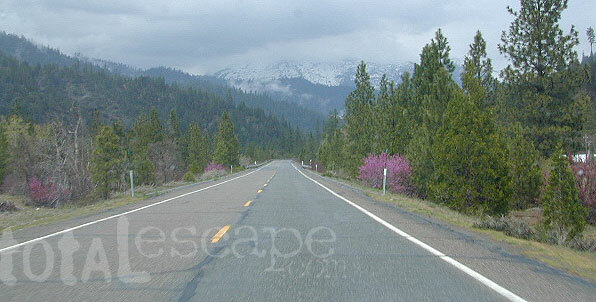 3.5 hour drive Shasta-Trinity National Forests Climb 4,500 feet as you follow the path of early miners and settlers. Traverse coastal plains, steep granite cliffs, arid manzanita and digger pine hillsides that parallel the beautiful wild and scenic Trinity River. Rich with gold-mining and transportation history. Historical and geological diversity. Check the Backroads Section for real adventure & off-the-beaten path routes.